I've been offline for the last few weeks. Sorry. However, I come back with a few lessons I learned during my time away from the computer. 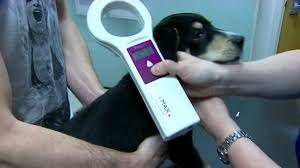 Stock photo -- NOT the beagle. Lesson Number One: Microchips work. I'm always telling people to microchip their pets. Here's a good example of why. Last week I got a call about a stray dog. The woman who found the dog said she walked up and down the neighborhood and couldn't find an owner. The dog was a sweet, old beagle. I took him to my kennel and discovered he had a microchip. I called around to different chip companies to find out who the chip belong to. (Sometimes this is an arduous task.) I discovered it was a Home Again chip. The chip had never been registered. (This happens more than you think.) However, I did find out the chip was implanted in 2004, and at that time Home Again and AKC were working together. On a long shot I called the AKC. Surprise! They had some contact information. When I called the number on file the guy the other end began to cry. His beagle had been stolen from his yard three years ago -- from a town two hours away. The owner never thought to look for his dog at the beach. But because of the microchip -- and the fact that he kept his same cell phone number -- the dog went home. The whole family came out to pick up Cubby. It was a tearful reunion in the parking lot. Days like that make up for all the crappy things (both figurative and literal) this job entails. 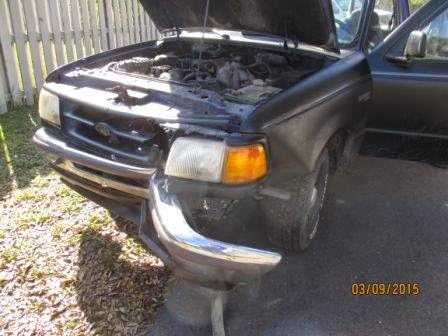 The other truck -- ouch! Lesson Number Two: Always wear your seat belt. A couple weeks ago a guy in a truck took a corner too fast and hit my work truck head on at 40 miles an hour. His Ford Ranger was totaled and had to be towed from the scene. My truck -- a full size Chevy Silverado with a bush bar and a winch on the front -- has a couple of dents. Sometimes bigger IS better. I was jostled pretty hard nonetheless. Fortunately, I was wearing my seatbelt and only suffered some soft tissue bruising in my back and shoulders. After a few days of light duty (and heavy muscle relaxers) I'm back, good as new. Guess who got back in the ring? US! And finally, Lesson Number Three: Sometimes you have to "Just Do It." Nike was right. 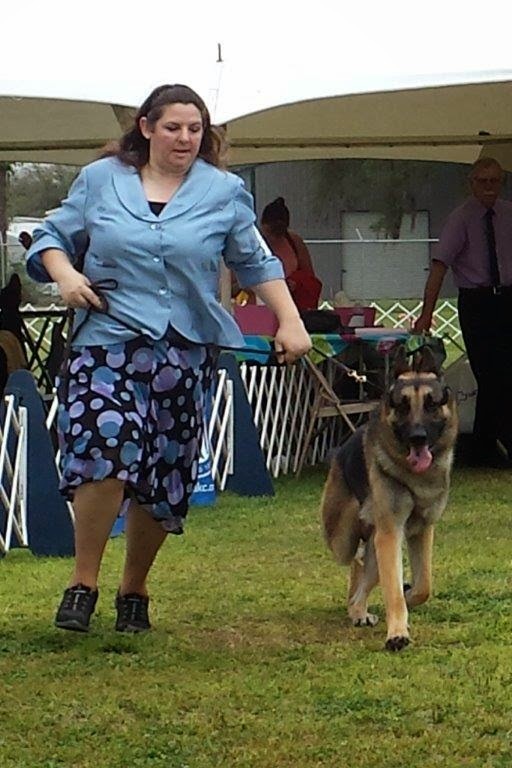 It's been a while since Jedi and I have been in the dog show ring. I've lamented over it. I've blogged about it. I was concerned that we were out of practice, worried I'd throw up, and afraid we'd look like fools. Despite all that, we got back in the ring this past weekend. No, we didn't look as good as we have in the past. Jedi's stacking is sloppy, my pacing is too slow, and those mistakes probably cost us the win this weekend. But you know what? We did it anyway. And we had fun. 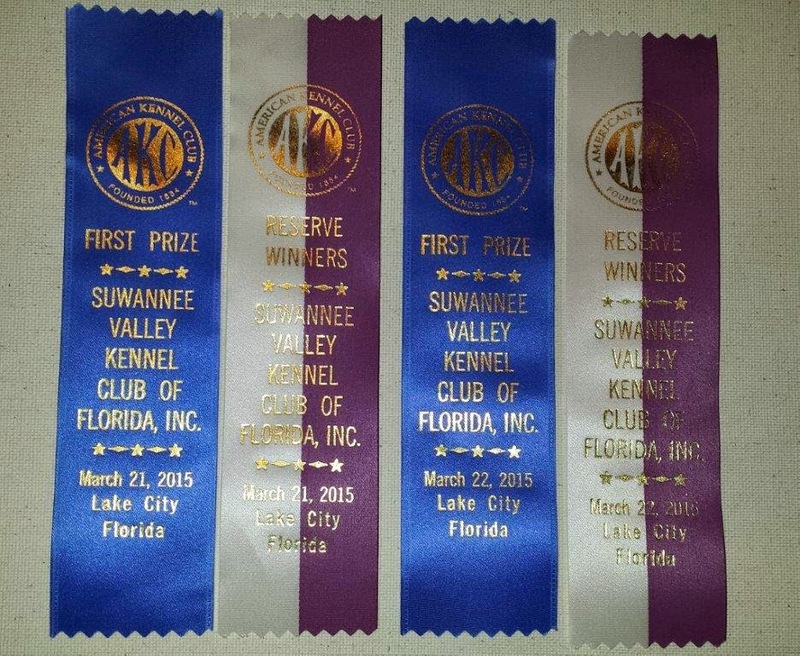 Both days we took first place in our class, and second place overall in dogs earning us the reserve ribbon. Still no championship points, but we're headed in the right direction. In fact, we're scheduled to do four more dog shows next month, and are looking at going to Georgia in May and June for additional shows. Stay tuned! Yes, my show clothes still fit -- but Jedi's show collar didn't! I had to buy a new one at the show. Thank goodness for ringside vendors. No, I didn't throw up on the judge -- or anywhere else. Fortunately the rings were small, the weather was nice and the judges didn't ask for a lot of running.